After the first installment, I felt the need to make domains more unique. At the moment they are only distinguished by their fortification, domain type and of course by their topology, or connectedness. The way domains are connected to each other is very important. In Risk, lands have only one stat (the continent they belong to), yet Ukraine is way more important than, say, Madagascar. For the same reason, make domains connect in interesting ways. Treacherous woods: all units in the domain fight as unarmed peasant levy. Swampy grounds: units must stop after entering the domain. Sea Harbour: +1 import and export. Only for coastal domains. Plentiful fisheries: harvest can be carried out in any season. Only for coastal domains. University: during a Fair action, the domain can spend a trade good and a food reserve to gain a prestige point. Metalworking tradition: every winter can transform one trade good to one arms without spending actions. Pilgrimage: every summer can spend one food reserve to a trade good without spending actions. Rich Mines: the first harvest of the year grants an extra trade good. The trade good can’t be consumed by this domain using the Gain Prestige action, but can be exported and spent elsewhere. To distinguish these tokens from the traditional type maybe flip them over. So, yeah. The next step for this is a PDF with a few scenarios. New products came out, and people wrote reviews. If you wrote one not in the list, let me know. Author: Chris of Soogagames (go there for more material) who by the way just released a free-as-beer Oddpendium. Over at In the Shadow of Puzzled Vikings Daniel Luce has a solo playthorugh and some encounters. Alex Chalk wrote a review in his blog To Distand Land. By the way, Levi Kornelsen, who made the supersweet ItO cover, made a great modern character sheet and then another more old looking. This game is soooooo good! Simple rules, wonderfully weird setting. It’s my go-to for gritty, deadly, dungeon-y adventure. The rules get out of the way and provide resolution mechanics without being cumbersome. Fighting is fast and lethal and doesn’t mess around with armor class. Gear generation is delightful. As a starter game, a pick-up for veterans, or a quick convention drop, Into The Odd definitely delivers and will certainly sit on my mobile device for quick access and in my convention kit. A first review from A Dungeon of Signs. the TL;DR: version is the second half of the fourth part. Dyson (yes, that Dyson) wrote a review of the box of the boxed set itself. I’m not even joking. I’m trying to write a domain game for RPGs because what’s around does not tickle my fancy. I also recently learnt that domain and demesne are pronounced the same in English. Since then, this never failed to make me giggle at each game using demesne instead of domain. So I decided to come up with a system where every domain is an actor: that is, each domain can do stuff each turn. While it’s not the only way to do it, it’s a way to abstract the whole “what changes in the world”, and it seems to be an approach that is not really common. Different types of domains will have different actions, in addition to different stats. Another decision I had to take is the granularity and the size of the game: this can vary from neighbourhood fighting against each other in a city (for example Necromunda, and my final design aim for the Into the Odd domain game) to planets being conquered for the control of the galaxy (Twilight Imperium). I went for a somewhat typical OSR scale, where each domain is either a County (or other non-small fief) or a City. Why cities? Because I wanted two different kinds of domains, and I’m really interested in the growth of cities. Also cities have tradesmen and crafts and trade, and that’s more interesting than simply raising armies and levies and killing a lot of peasants. This way you can starve citizens until they kill their city council too. Before I continue with the rules, I want to spend a word on tactical infinity: anything that the rules say, feel free to override, either by the authority brought by consensus or by referee. I am of the opinion that the greatness of role-playing games is not that you play a character, but that rules are routinely adapted to improve play. Cherish that you are empowered gamers, free to make your own rules. What I suggest for domain game is: before each action in the game, players can suggest to have a small or long adventure to affect it. It can be something as simple as having a chat with a fellow ruler, or clamping down on brigands with an expedition of your dudes momentarily in the guise of murderhoboes, or leading the assault on a fortress. Degrees of success in the endeavour can grant a modifier to the action in the domain game, or give an automatic success, or present a variation in the result. Similarly, these adventures can happen after the action to prevent an horrible failure, or converting a near success to a success, or to temporarily increase effectiveness. For example, domain infrastructure limits trade; clamping down on bandits going all murder against them can temporarily increase the amount of traded goods. If the players manage to make a great impression on the bandits and get rid of their bosses and charm a few key bandits they might even gain a unit of light infantry on the side. I suggest that each player character can participate in only one adventure per season. And that’s why you have henchmen and companions. Also this whole domain-caused-adventures helps bridge the abstraction gap between domain play, based on seasonal turns and very chunky entities, and traditional RPGs, where you play in turns or rounds with entities that are a single person. Trade Good: they are created by cities. It’s more or less 5000 to 20000 coins worth of stuff, depending on your economy. They can be spent in many ways. Food Reserve: they are like trade goods, but are only consumed by besieged cities. Arms: they are like trade goods, but they are used only to equip armies and levies and gives them combat advantage. If you are being fancy, or you have places that make excellent weapons like Dwarven, Flemish or North Italian Cities, they also have a rating depending on the metalworking level of the manufacturing city; a higher rating means mo’better advantage. Armies, raised by counties. They fight well. How well depends on the system you use. A county can raise only a single army at time. They can also use a single Arms token each, to get combat advantage. To raise a second army, the first one must be disbanded or destroyed. If disbanded in the same region, the army can be raised again next season. If destroyed, the leader must save or die or be captured, and the county must wait 2d6 seasons or sacrifice both a trade good and an arms token to be able to raise an army again. You can represent the recovery putting white dices on the domain and spin them down as time goes by. Levies, raised by counties and cities. They are not as good as Armies. Free City levies or rioting city levies fight as well as real Armies. If a levy is raised, the raising domain can’t do any actions until the levy is disbanded in the same region or is destroyed. If destroyed the domain must wait 1d6 seasons before taking any action. You can use a black die to represent the recovery. Each domain has also a prestige score and a fortification score. Prestige is like Charisma, but for domains. It amounts to “how awesome other rulers think you are and how much they want to be at your parties”. No game mechanics for it yet, but consider this: if you had to pick, you’d rather be making happy a place like Bruges than a place like, dunno, Dunbar? And df you’re asking dude, what’s Dunbar? well, that’s the point I’m trying to make. Fortification gives advantage to the defender (depending on your resolution system). Furthermore, each 8 points transform a hit by attackers into a miss. Domains can do one action per season. Four seasons per year. It’s also possible to play with two seasons per year (summer and winter) without much change. Each domain can also import and export 1 unit of trade goods, food reserve or arms per turn. Raise an army: the lord of the domain raises their lances and readies them for battle. The county’s army is deployed in the county and can immediately move. A domain can only raise a single army. If the army stands at the end of the winter without being disbanded, it consumes a trade good either from its home domain of from the domain where it is, if the host domain kindly provides or if it pillages (see pillage later). If it can’t consume food or pillage it get disbanded. Raise a Levy: the county raises a levy. The levy is deployed in the county but can’t immediately move: must wait a turn. Remember: if a levy is raised, the domain can’t otherwise act. Trade: the import and export limits for the county are both raised to three for this season. Harvest: produces a unit of Food Reserve, which is kept in the county. This can be done only during Summer and Autumn. if playing with a 2-seasons year, the harvest provides 2 Food Reserve units. Food Reserves can be exported. Fortify: the fortification score of the domain goes up by 1. Spending a trade good makes it go up by another point. Gain Prestige: the domain can increase its prestige by 1 by spending a Trade Good. Fair: only in summer. The import and export limits of the city are lifted for this season. Trade: the import and export limits for the city are both raised to three for this season. Raise a Levy: the city raises a levy. The levy is deployed in the county and can immediately move, attack and be disbanded in the same turn. City levies are quite eager. Remember: if a levy is raised, the domain can’t otherwise act. Manufacture: produces a unit of Trade Goods or Arms. The goods or arms are kept in the city. They can be exported too. Siege: stop the domain from taking any action except Raise an Army, Raise a Levy, Fortify. Cities can raise levies as soon at any point ant the levy can attack immediately enemies in its domain and then, if desired, disband. Pillage: add one pip to the black die of the domain, to a maximum of 6. If no black die is present, add a die on the 1 face. This can be countered by having the domain consume 1 Food Reserve. Doing so waives the unit’s winter maintenance cost. Seize: the occupier takes control of the domain. As a reaction to the action being announced, the defender can stop the action by attacking. The defender in this case won’t benefit from the fortification advantage unless the occupier was Sapping or Seizing. If the defender wins the fights, the occupying action is countered and all is well. If the attacker wins the fight, the action succeeds. If a domain is seized, it can be razed instead. In this case it can’t carry out any action for the rest of the game. Each season a city has a black die and enemy troops Saps, Sieges or Pillages it, it must roll a d6 and score at least the amount on the black die. If successful, all is well. If failed with an odd number, the city raises immediately a levy and attacks the occupier. 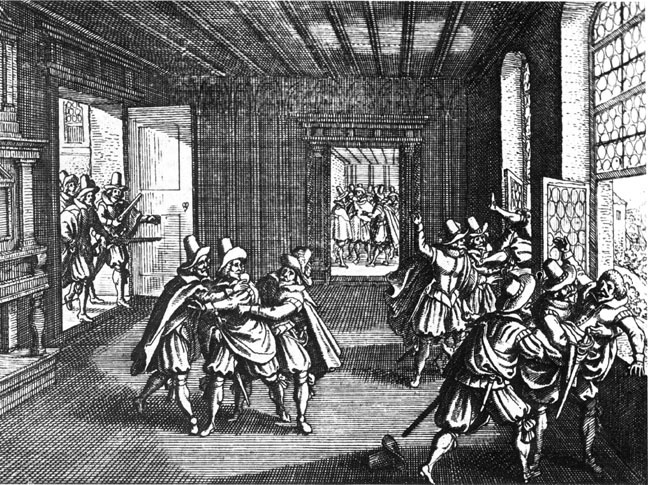 If failed with an even number, the city reenacts the First Defenestration of Prague and joins the side of the occupying forces. News: Wonder & Wickedness release! and the Lost Pages Shop shuts down in ten days! Two bigs pieces of news today! First, I’m proud to release Wonder and Wickedness, Brendan’s sorcery supplement. support for magic duels! like in fiction! seven magic disciplines and a whole lot of new spells. Some have appeared on Brendan’s blog before. The PDF and Print+PDF are available at the Necropraxis section of the Lost Pages webshop. Like for Into the Odd, the PDF is available immediately and the print copy will ship in January. Now, the other piece of news: January 1st the webshop closes. The stop might be momentary. Or permanent. I have no idea, but I’m still waiting for news regarding the new EU VAT law. If you want to get some Lost Pages swag before it’s too late, head to the webshop. After that, I will only get orders by email. Fulfilling will resume regularly as soon as I get back to the UK. tl;dr: I will probably have to stop selling PDFs from the Lost Pages shop. This might make the whole enterprise of writing RPGs and selling them on the web kind of not sustainable. If you want PDFs, get them now. New tax regulations are about to unfold over the EU. From January 1st whoever sells digital products through an automated process to a customer in the EU must pay VAT to the country of purchase and not to the country of supply. This is done to stop shady profit-shifting companies like Amazon and Apple from selling from countries with low VAT (Luxembourg) and dodge taxes, despite having fulfilment operations in the same country as the purchaser. The issue was partly covered by the Guardian. HMRC in the article mentions they spent effort to “publicise the changes” but I received zero notice from HMRC. Dave Walker made a funny/grim cartoon about it: The unintended effect is that this will also kill many small businesses. Possibly including Lost Pages. I have to apply the correct VAT for ebooks depending on the country where you are in. It’s a mild pain, but doable. I have to get two non-conflicting proofs that you actually are in that country. For example, the billing address of your bank account, geolocation of your IP, the country of issue of your SIM card if it’s over mobile. The problem is that these bits of informations are either unreliable (like geolocation) or invalid (if you’re momentarily in the UK but live in France, your bank account billing address conflicts with the rest). Payment processor are not allowed to give me the information, even if they had it. Paypal does not seem care. I have to keep the collected data for ten years within the EU. Having tiny businesses holding this volume of customer data is a security nightmare waiting to happen. I would have to register for VAT and make at least 8 VAT returns per year. It’s a monumental burden for a dude working from a corner of his flat. The whole rigmarole happens because this new law ignores the VAT threshold for small businesses. Companies ordinarily have to have a minimum turnover before handling VAT, but this law was written to deliberately ignores the threshold. This means a whole lot of bureaucracy. And being liable in 28 different countries. A simple way to comply is to start selling ebooks on Amazon. So Amazon pays their taxes with one hand, and immediately takes their tax money from your pocket with the other hand. And this is one of the reasons I try not to buy on Amazon anymore. I suggest you do the same. A harder way to comply is to find a platform that does this for me (they all have a long list of caveat) or write my own. For example, RPGNow does not pay this tax, despite selling to EU customers. Mind you, the fact that they do not have EU operations does not matter: if the customer is in the EU the EU has the right to apply tax on the transaction, that’s how it works. I contacted RPGNow several times, and they told they would get back to me, but they did not. Thing is, I don’t mind paying taxes. I mind hoarding your personal data. I mind being liable for unlimited fines in 28 countries. I mind spending my days filling paperwork instead of writing games. The outcome: I will probably have to stop selling PDFs as of January 1st 2015. This might make the whole enterprise of writing RPGs and selling them on the web kind of not sustainable. If you want PDFs, get them now. Write about this. Share the comic on social media. Share this on social media. Write to your MP, MEP, MSP, whatever. They are at times oddly sensitive to people telling them about their problems because it gives them an occasion to show off a bit. And maybe to act on them. Especially if they are in a contested seat. There are two petitions you can subscribe, one for the UK and one general for the EU. I’m going through the last part of the layout. Available in before the end of the year, print version in January. More news soon.